save the life of a co-worker, friend, or anyone else stricken with sudden cardiac arrest. Effective. 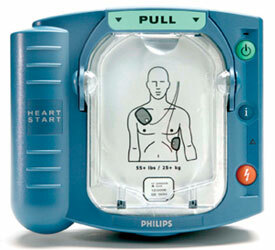 Philips pioneered the use of biphasic waveforms in external defibrillators. The electric medicine delivered by the HeartStart OnSite has been rigorously studied, with more than 40 studies demonstrating high first shock efficacy and effectiveness across the full spectrum of patients. Philips SMART Biphasic therapy uses a unique combination of high current to maximize effectiveness and a lower energy dose to minimize side effects that are harmful to a fragile heart. The result – the HeartStart OnSite delivers its maximum shock strength starting with the first shock. Make the most of CPR. Recent studies have shown that CPR is even more vital to survival than previously realized. Yet its benefits dissipate in seconds. Delivering a shock quickly after chest compressions is critical. The HeartStart OnSites Quick Shock feature delivers therapy in just 8 seconds (typical) after chest compressions. Other devices can take 2 or 3 three times that, reducing the likelihood of shock success, and potentially, survival. Give your early defibrillation program the best chance for success. The HeartStart OnSite Ready-Pack configuration arrives to you virtually ready-to-rescue out of the box, with device pre-installed in carry case, and battery and pads pre-installed in the device. The Ready-Pack is designed to be the simplest-to-deploy AED, giving you the peace of mind that it is deployed correctly, with less effort. The simple and welcoming set-up and maintenance instructions are designed to take the intimidation out of owning a defibrillator. Designed for the ordinary person in the extraordinary moment.